Can we SEE climate change? Aircraft produce about 10 trillion cubic feet of water vapor every year. Much of it manifests as visible clouds, which sometimes persist and can quickly cause massive cloud cover over millions of square miles. Haven’t noticed? You’re way behind. Millions of witnesses have been alarmed by the artificial clouds produced by aircraft, especially before incoming storms when cloud seeding has been heavy and the atmosphere is thick with cloud-condensation nuclei (“CCNs”). 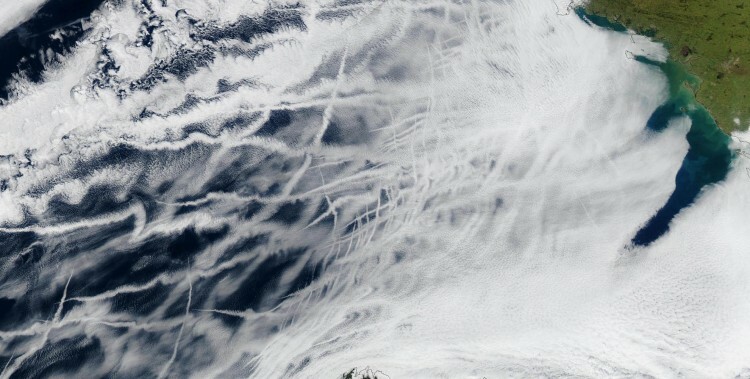 Some people have referred to this phenomenon as “global dimming”– the blocking out of the sky by artificial clouds– and many mistake this for “geo-engineering.” Actually, it’s the inevitable meteorological consequence of heavy jet air traffic emitting super-heated water vapor into the frozen atmosphere laden with cloud-seeding chemicals. This practice is conducted in countries across Europe, Africa, North and South America, the Middle East, and in over two thousand counties in China. Cloud seeding material (salts, metallic aerosols and “mineral dust”) are now a constant part of Earths atmosphere. What are the effects of the additional cloud cover?